February 10, 2019 at 9:56 pm. When asked to correct their headlines to accurately reflect the truth and fall in alignment with the CDC’s public warnings about data misrepresentation, no media outlet changed their reporting. Fast-forwarding to our current American media landscape in respect to measles reporting sees much of the same fear mongering and, what appears to be, purposely inaccurate reporting. The Sacramento Bee recently ran their headline titled Measles outbreak may spread to California, doctors are warned – with risk of deafness, autism. The public was presented with the idea that there exists a risk of autism from the measles. In their opening paragraph, the SacBee story warns, “…health experts say [measles] can cause deafness and autism in its survivors.” The article goes on to state “Measles has been proved to cause intellectual and neurodevelopmental disorders, including autism, in children.” How did the Sacramento Bee make their autism-measles connection? To the average reader, the SacBee appears to cite valid data found by UC Davis researchers and the MIND Institute. However, when taking a deeper look at the article’s cited/linked research, it is clear that the SacBee completely and willfully misrepresented the MIND Institute’s data. In the MIND institute’s original data, the researchers were referring to rubella, not measles. The SacBee took it upon themselves to create a false narrative by deceptively replacing the word “rubella” with “measles” in the MIND Institute’s research in an example of highly dishonest and inaccurate reporting. The SacBee article’s author Cathie Anderson was contacted with the errors and asked to print a correction and retract the false information. In the latest version of the SacBee article the link to the MIND Institute document, which confirmed they were discussing rubella, was removed yet the remainder of the article and its misleading title remain. 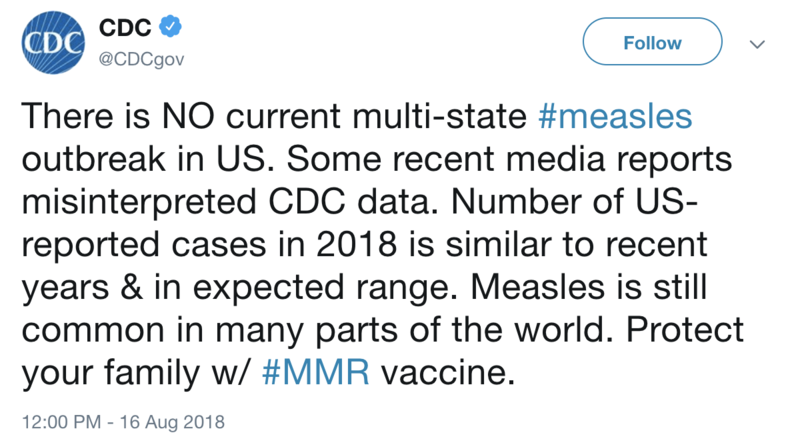 On November 29, 2018 Holland publicly predicted there would be an overhyped measles hysteria used to push through new, coercive vaccine bills. She warned at that time of “new assaults coming in 2019” in Washington, Maine, Oregon, New Jersey, New York and other states. Her predictions thus far have remained shockingly accurate. In addition to having a bill already on the docket to require reporting to a vaccine tracking system and to allow optometrists to administer vaccines, an Oregon representative has just announced his intention to introduce a bill mirroring California’s SB277. Citing Washington’s measles cases, Oregon Rep. Mitch Greenlick (D-Portland) proposed a bill, which has not yet been finalized, aiming to eliminate all non-medical exemptions for vaccines the state requires for children attending schools and childcare facilities. Greenlick has publicly shamed parents for not vaccinating their kids while also comparing people who believe vaccines can cause harm to people who believe the earth is flat. Author and co-founder of Generation Rescue J.B. Handley recently dismantled the media’s false narrative being spread that the vaccination rate for the MMR vaccine has fallen lately due to ‘irresponsible parents.’ Analyzing Oregon’s MMR vaccine coverage data, Handley showed evidence from the CDC clearly demonstrating that the MMR vaccination rate has held steady for more than 20 years with little variation. The same went for Washington when the CDC’s data was looked at. 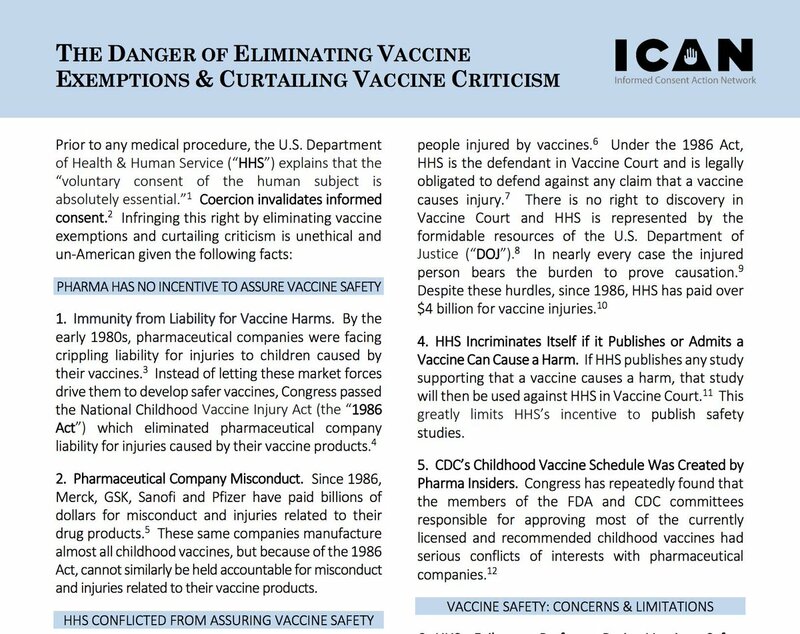 Observing the current number of active vaccine bills across America, it appears that many states are signaling a 2019 offensive to eliminate the legislative barriers once protecting people from Big Pharma’s ‘unavoidable unsafe’ vaccine products. Find out what vaccine legislation is happening currently in your state using The National Vaccine Information Center’s Advocacy Portal database. liberty aggregator April 15, 2019 at 12:17 am. liberty aggregator April 7, 2019 at 7:28 pm. liberty aggregator March 31, 2019 at 11:07 pm. liberty aggregator March 27, 2019 at 2:04 pm. liberty aggregator March 26, 2019 at 6:22 pm. liberty aggregator March 24, 2019 at 6:54 pm. liberty aggregator March 23, 2019 at 3:28 pm. liberty aggregator March 17, 2019 at 7:12 pm. liberty aggregator March 10, 2019 at 6:16 pm. liberty aggregator March 6, 2019 at 6:55 pm. liberty aggregator March 3, 2019 at 6:21 pm. liberty aggregator February 26, 2019 at 11:55 pm. PROTESTS IN THE WEST This week thousands rally at state capitols up & down the west coast, coming together into one resounding voice; phone lines are open to Ask Del Anything. #SB276 #HB1638 #HB3063 #Measles #MissedInformation #VaccinesWork ??? This is the 1st rigorous investigation into the generational effects of #glyphosate exposure. It shows the exposed (rat) parents pass along mutated genetic information, and their grandchildren and great-grandchildren show dramatically increased risks of a whole range of diseases. These students did what they were told. And then did it again. And came down with MUMPS ANYWAY. Where's the headline: MUMPS COMPONENT OF MMR FAILING NATIONWIDE? 14 of the 16 infected students had received the two recommended doses of the MMR vaccine.